Lance Armstrong last night finally came clean about his years of using performance-enhancing drugs in his first lengthy public interview since the governing committees accused him of running the 'sophisticated' doping ring to secure his world record titles. ‘I view this situation as one big lie that I repeated a lot of times,’ he said in an televised interview with Oprah Winfrey screened Thursday night. 'I view this situation as one big lie that I repeated a lot of times and as you said it wasn't as if I just said no and moved off of it. 'I viewed it as very simple. We had things that were oxygen boosting drugs for lack of a better word that were incredibly beneficial to endurance sports. When was the last time he doped: 'The last time I crossed the line- that line- was in 2005. 'This is too late, it's too late for probably most people and that's my fault. 'I am flawed, deeply flawed. I think we all have our flaws. I deserve this. 'I didn't understand the magnitude of that following and we see it now... The important thing is that I am beginning to understand it. Oprah: Did it not even feel wrong? Oprah: Did you feel in anyway that you were cheating? Lance: No, that's the scariest. Oprah: Yes or no, in all seven of your Tour de France victories did you ever take banned substances or blood dope? 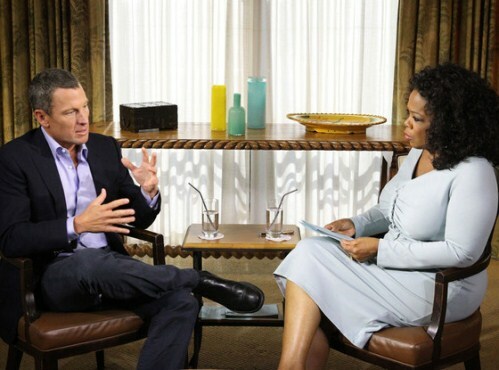 Oprah: Was it humanly possible to win seven Tour de Frances if you were not taking performance enhancing drugs? Lance: Not in my opinion. The Department of Justice pursued a two year criminal investigation into Armstrong, pursuing charges of fraud, drug trafficking, witness tampering. They then dropped the investigation without an explanation. Oprah: -The wolves had left the door. Lance: And those are some serious wolves. For now, he is formally banned from all sports because of the doping charges, and officials at the World Anti-Doping Agency say that a heartfelt confession to the Queen of Talk is far from enough for them to even consider lifting his band. 'He's got to follow a certain course,' the group's director David Howman said. On Oprah's end, she said that viewers should expect to be 'satisfied' by the interview. 'I felt that he was thoughtful, I thought that he was serious, I thought that he certainly had prepared for this moment. I would say that he met the moment,' she said in a promotional appearance on CBS This Morning, hosted by her good friend Gayle King. She did not go into too much detail about the interview, except to say that close friends and family- no lawyers- were present for the taping. She also claimed that at one point during a break in taping, Armstrong asked her if the questions were going to lighten up. Armstrong's lawyers were against the meeting but he went ahead with it anyway. back trust and apologize to people for the rest of my life,' he said. waited to air the interview until Thursday night. Armstrong made only two public statements between the time of the taping and the on-air reveal, texting a message to the Associated Press. 'I left it all on the table with her and when it airs the people can decide,' he said. This has been a tough week for the former star, as the International Olympic Committee sent him a letter asking him to return the bronze medal that he won in the 2000 Sydney Games. He received the letter on Wednesday night, meaning that even if Winfrey mentions it in a voiceover during the long-awaited interview, Armstrong will not have any opportunity to directly respond during the broadcast. The IOC said that they decided last month to ask the cyclist to return the medal, though it waited to make their move until after he had been stripped of his seven Tour de France titles.